Well it has been a while since I published Part 1 of this tale. I finally completed the three British battleships and mounted them on the "sea" bases that I use. You will notice that I used two different colors on the decks, a darker on the Canopus and Collingwood and a lighter on the Majestic. I'm not sure which one I'll use in the future for British ships. With the white superstructure, turrets, and guns, the lighter deck looks a little "washed out" even though it may be more accurate. Please click on the photographs to get a larger image. Just don't "notice" the touch-ups that still need to be done. The ships have no masts and I'm not sure how or if I'll make any. And I still need to paint the wakes on the bases. But for right now they are "battle" ready. The two Russian battleships are still "under construction." I just received an "ocean" battle mat from Cigar Box Battle. It is, first off, very nicely done. Not as dark as I expected it to be, but still very nicely done. Here are some pictures with my 1:2400 Panzerschiffe Japanese and Russian pre-dreadnought battleships as they approach each other in line of battle. Click on pictures to enlarge them, please. Back in early March, after helping play test the soon to be published "Si Vis Pacem" rules (see previous post) and reading a lot about the new rapid prototyped plastic ships from War Times Journal, I decided to obtain several of their 1:2400 scale ships as a test bed project. So I ordered two British predreadnoughts (HMS Majestic and Canopus) and two early Russian predreadnoughts (Sissoi Veliki and Navarin). 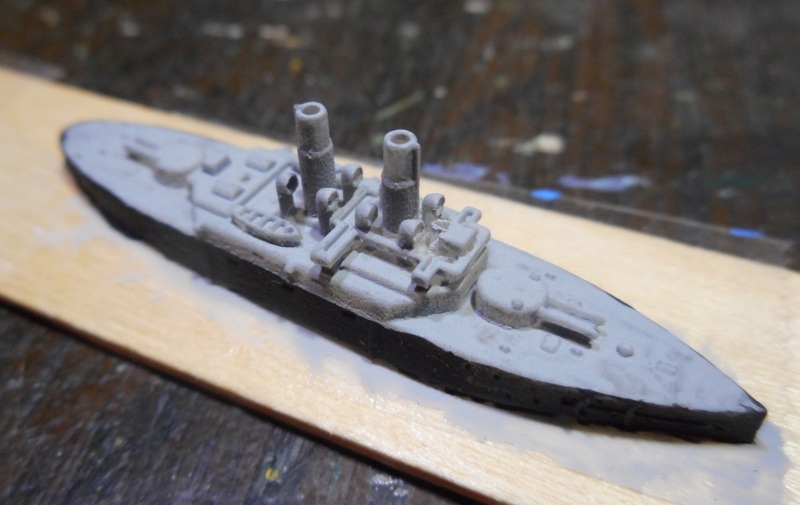 As a bonus, Jim from WTJ sent two extra ships, HMS Collingwood (with "undercut" gun barrels) and a Thorneycroft 4-stack destroyer used by the Japanese. They all arrived very well packed. At first I wasn't sure which ship was which (except for the destroyer, of course), but then I discovered the almost microscopic SKU on the bottom of each ship. First let me say that they are delightfully intricate "sculpts" with a lot of detail including lifeboats, ventilators, and different decking heights, some undercut. 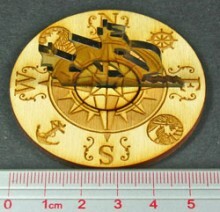 Once cleaned, as recommended by WTJ, they turned a somewhat milky color but that was predicted by WTJ on their web site. Here they are in their"naked" plastic. The two Russians (Navarin, top, and Sissoi Veliki, bottom) are on the left; the three British (Collingwood, Canopus, and Majestic, top to bottom) are in the center; and the Japanese Thorneycroft destroyer is on the right. Even this picture reveals the detail in the "sculpting." 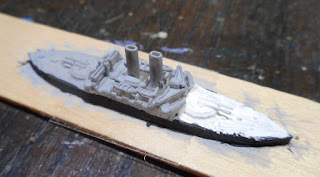 My undercoat of choice is gray gesso, which I used on these ships. 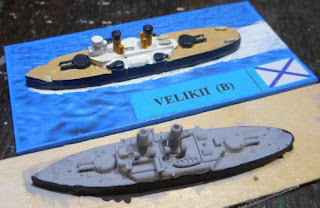 Since gesso is really designed to give smooth surface with tooth to canvas painting surfaces, using it on such small models really reveals its "roughness" as you can see with these two pictures, especially the Sissoi Veliki. I think I'm going to have to get a finer grained undercoat, and probably uppercoat paints, if I proceed with this project. 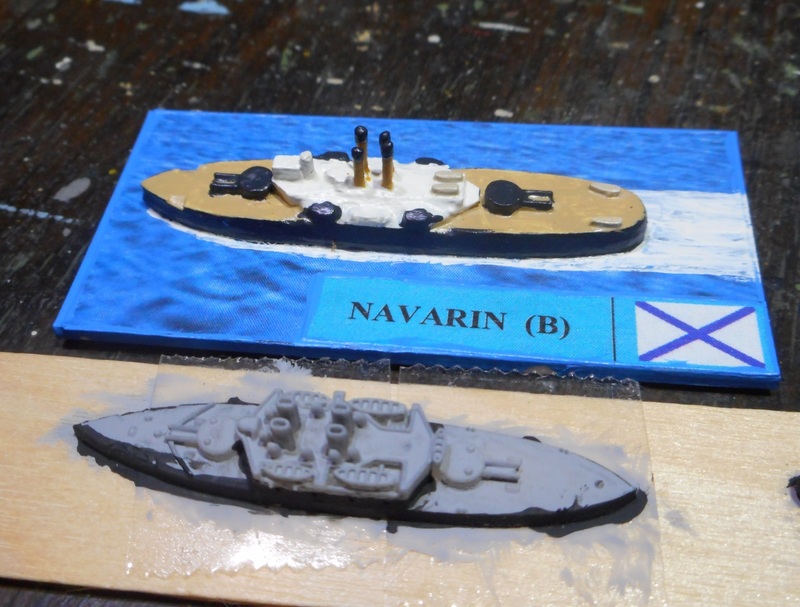 HMS Canopus (left) and Majestic (right), with her hull already painted black. Over a period of several days (interrupted by various tasks, including a 3 1/2 year old granddaughter), I continued with the painting, resulting in this stage of progress. 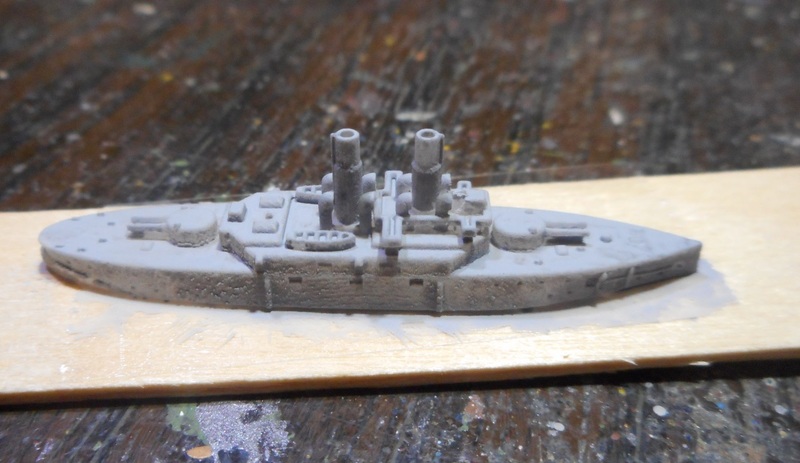 HMS Majestic fully painted with black hull, white upper works, ocher funnels, and holystoned deck. Between the lighting and my camera, she looks rather washed out. I'm going to attempt a light wash to bring out more of the detail. HMS Canopus still requires ocher coloring on her funnels and a holystoned deck. HMS Collingwood with only forepart painted white. I may paint the exposed gun barrels black for some contrast. You can also see more easily the "undercut" main gun barrels. The other four capitol ships have a "tab" under the barrels to prevent damage to them from handling. I can't really tell the difference unless I make a close examination. 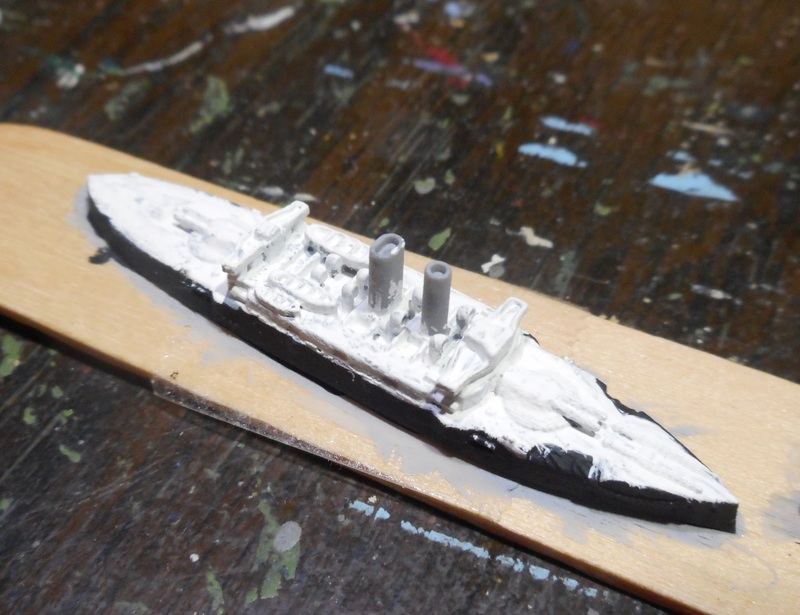 Japanese Thorneycroft destroyer with only black hull painted. Picture is a little fuzzy as it is not easy focusing on such a small model only 28mm long. Russian Sissoi Veliki with only black hull painted. Comparison of Panzerschiffe (above) and WTJ (below) ship models. Russian Navarin with only black hull painted. As you can see from my beginning painting, I am initially going with peacetime colors, mainly black hulls, white upperworks and main gun turrets, and ocher stacks. My concept for the use of these ships will be "imagi-nation" battles in the Mediterranean as the Franco-Norman world and the Russo-Byzantine world struggle for control of the Middle Sea. This is loosely based on a parallel time-line from H. Beam Piper's Lord Kalvan of Otherwhen novel and its follow-ons written by Roland Green and John F. Carr. It has been a long time since I made a naval post here. Lately the Jackson Gamers have been assisting David Manley and Stuart Machin of Long Face Games in play testing their latest naval rules. 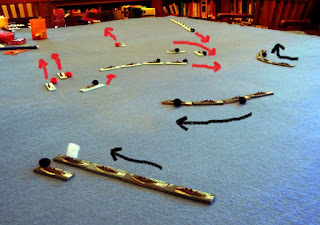 They have developed "Si Vis Pacem" for quick play WW1 naval gaming, subtitling it "How you can play Jutland in a day." Here is a report on our final play testing with a brief description of the action, some pictures, and a few comments about the rules. 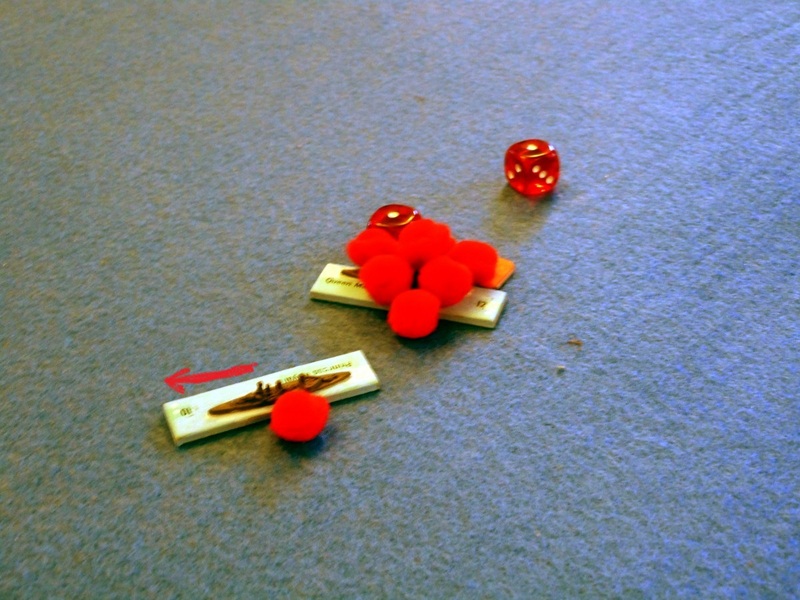 We used Lord Sterling's 1:6000 scale WW1 ships, which are based on the "Jutland" board game counters. If you'll remember, we used them back in 2016 to do a re-enactment of Jutland, using Avalon Hill's "Jutland" rules. Based on the situation of 31 May 1916 (first day of Jutland), the British battlecruiser squadrons, reinforced by the 5th Battle Squadron, are out hunting for Germans. And the Germans are there, but more than VAdm Beatty was led to believe. VAdm Scheer and VAdm Hipper had planned a surprise consolidating the 1st Scouting Group with the 3rd Battle Squadron. The British had 4 super-dreadnoughts and 6 battlecruisers versus the Germans 8 super-dreadnoughts and 5 battlecruisers. As the opponents spotted each other at 26,000 yards, each force immediately started closing. Soon large caliber shells were raining down on the "steel castles." But the lighter British battlecruisers were at a disadvantage, soon sustaining heavy damage to all and having two blown apart. But the Germans didn't escape unscathed, having several ships sustain heavy damage and several more medium damage. 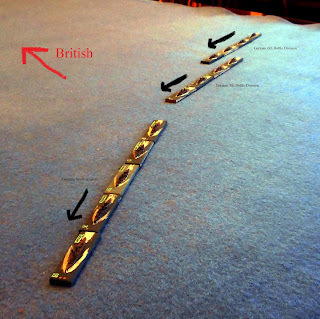 The British battleships also sustained some damage to all four. Smoke sighted on the horizon behind both fleets had the commanders looking over their shoulders wondering if it was friends or more foes. The three battle squadrons of the British Home Fleet were advancing in a long line from the northeast while the British 3rd Battlecruiser, 1st Cruiser, and 2nd Cruiser Squadrons were approaching from the northeast. The lead British battleships (2nd Battle Squadron) soon made their impact felt by firing on the German 6th Division/3rd Battle Squadron, which included SMS Friedrich der Grosse, Scheer's flagship. Knowing that his fleet was now outnumbered, Scheer decided to call it a day. He had destroyed two British battlecruisers and heavily damaged four more, plus damaged four British battleships. He had averted the Kaiser's displeasure by not loosing any ships, only having four battleships and one battlecruiser damaged. With the 1st Scouting Group in the lead, the German 5th and 6th Battle Squadrons sail towards the southeast, hoping to lead the lead the British into an ambush. The British Battle Cruiser Fleet with 1st Battlecruiser Squadron, 5th Battle Squadron, and HMS Lion (fleet flag) and 2nd Battlecruiser Squadron advance towards the Germans. All of a sudden Beatty realized, "By Neptune's beard, those are battleships!" Later in the action the German 6th Battle Division turns towards the approaching British battleships, the 5th Battle Division and the battlecruisers try to get around the rear of their British opponents. In the background, the British 1st Battlecruiser Squadron has had one ship heavily damaged, leaving the line, while the same has happened to HMS Lion (Beatty's flag ship) in the foreground. In the far background the British Home Fleet sails closer, with the lead, HMS George V, sustaining medium damage which she returned in kind on the SMS Friedrich der Grosse (Scheer's flag ship). 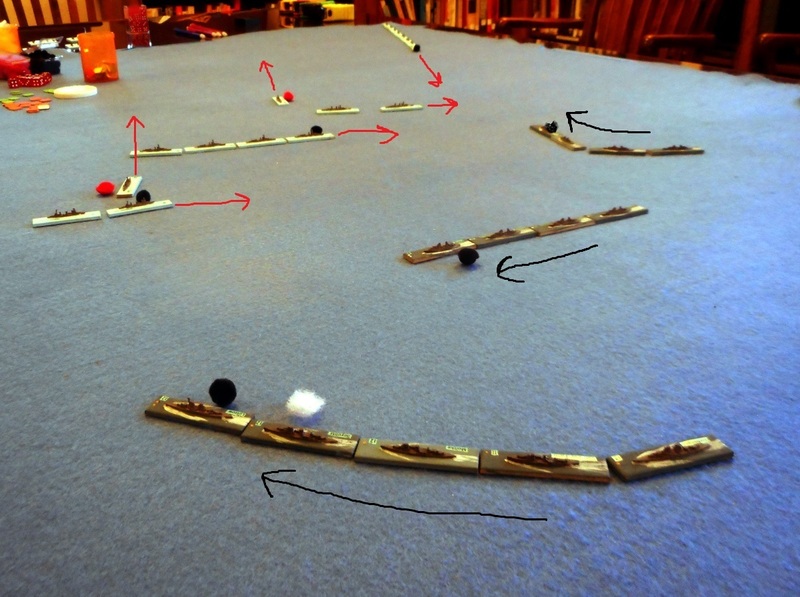 The red puffs indicate heavy damage, the black medium damage, and the white light damage. Now a third British battlecruiser sustains heavy damage and withdraws while the remaining three have medium damage. The two lead British battleships of 5th Battle Squadron (center) have sustained medium damage. Three German battleships and one battle cruiser have suffered medium damage and one battlecruiser has suffered light damage. The German 1st Battle Squadron is approaching from off the picture to the right. With HMS Lion and the two battlecruisers of 2nd Battlecruiser Squadron heavily damaged and fleeing the area, the British battleships attempt to screen them from fire from the German battleships. On the top, one of the 1st Battlecruiser Squadron ships is also fleeing. When your defense factor is a one and you roll a one under fire from a German battleship who has crossed your T, just about any German roll will result in destruction. Here HMS Queen Mary blows up as the heavily damaged HMS Princess Royal flees. Final shot of the battlefield when VAdm Scheer made his decision to withdraw and declare victory. With 16 battleships of the Home Fleet closing, Scheer really had no other choice. "Si Vis Pacem" is a quick playing rule set that is both simple and complex. It is easy to pick up on the rule basics and a player can function without too much guidance after the first round of firing. 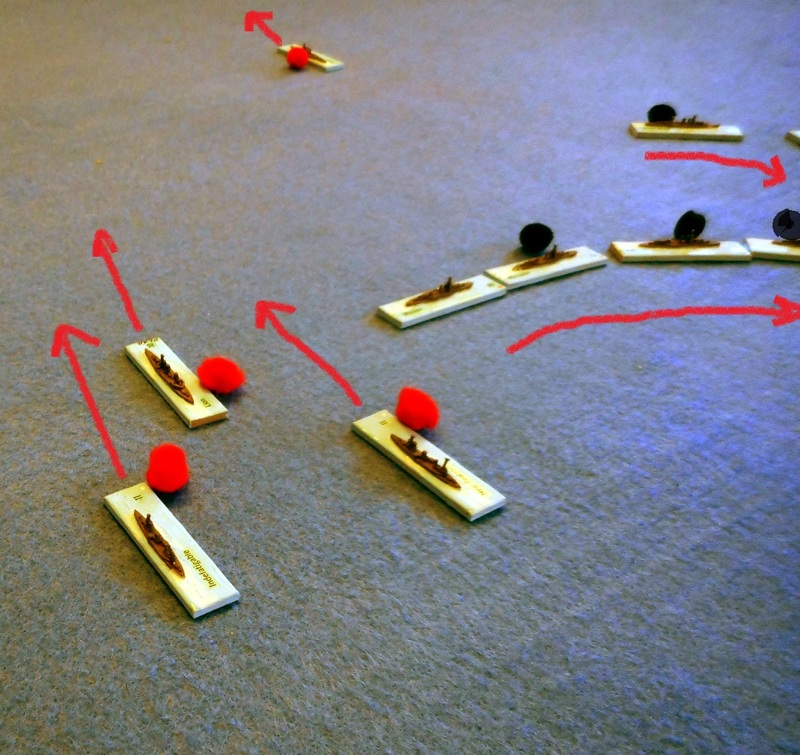 Who moves first or second is decided by the side with the initiative while firing is done sequentially with the player having initiative firing a unit of ships first, then the second player firing, then back to the first player. Torpedo attacks are done the same way after all gunfire which allows ships being attacked to fire at their attackers, potentially driving them away. There are advanced rules and campaign rules we didn't try, just concentrating on the basics. The advanced rules add some additional flavor and complexity to the basics, but not enough to take away from the playability of the rules. Based on what I've read in David Manley's pre-dreadnought "Broadside and Salvo," the campaign rules will allow one to fight their own actions in the North Sea between the British Home Fleet and the German High Seas Fleet. We are looking forward to the release of "Si Vis Pacem" later this spring and to more WW1 naval games in the future. Yesterday (Memorial Day) some of the Jackson Gamers gathered to play a WW1 naval game in memory of the 100th anniversary of the Battle of Jutland. I titled this post "Jutland with a Vengeance" as Jay, Lord Sterling, our game master, used almost all of his 1:6000 scale ships, including quite a few that were not actually at Jutland, such as the SMS Goeben which was in Turkish livery and HMS Queen Elizabeth which was in drydock. But we had a lively time nevertheless. There were 7 players, 4 British and 3 German. I had the task of commanding the German fast scouting group - 7 battlecruisers, 1 armored cruiser (SMS Blucher), 2 light cruiser squadrons, and 4 half-flotillas of destroyers - as Vice Admiral Hipper. 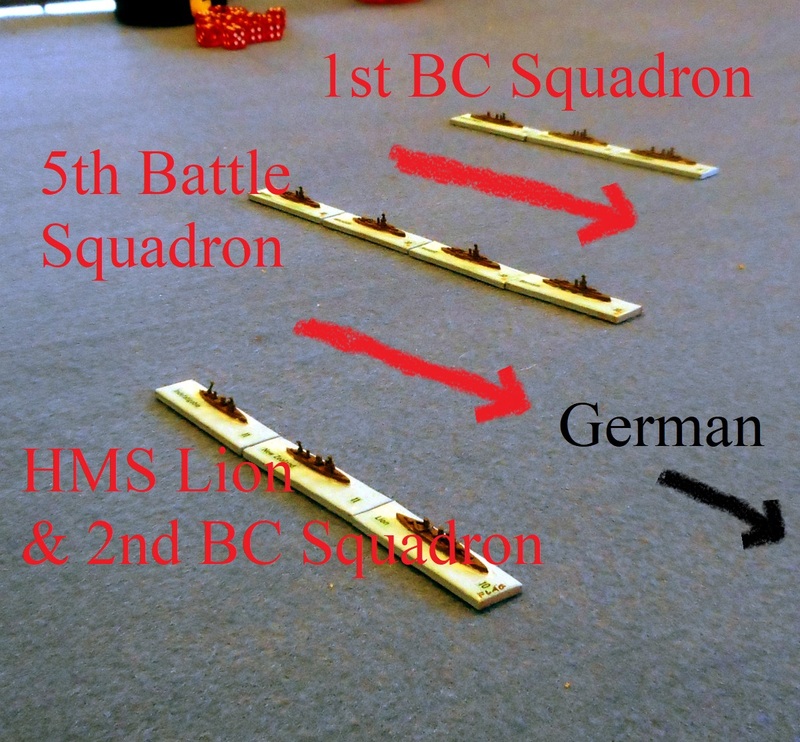 The other two German players (Travis and Ed) split the four battleship squadrons and the other light forces. I'm not sure how many British squadrons there were, but there were quite a few! My son Sean commanded the main British battlecruiser squadron as Vice Admiral Beatty so we were bound to "cross swords" and we did. The other British commanders were Jay, Phil, and Grant (a new addition to our ranks). 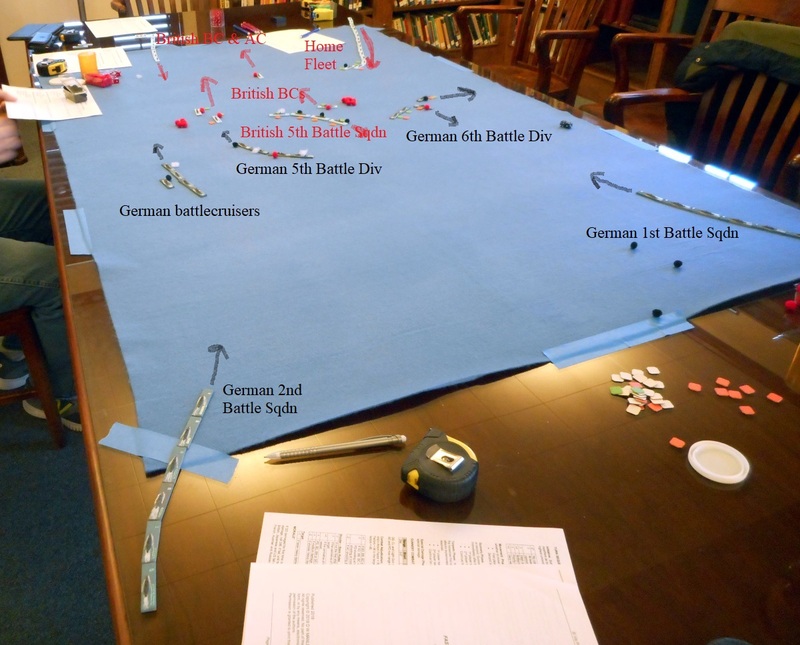 We used a slightly modified version of Avalon Hill's venerable "Battle of Jutland" rules. Jay, Lord Sterling has, where available, glued a 1:6000 scale model of each ship to its appropriate counter. Pursuant to your orders, the reinforces fast scouting group discovered advance elements of the British fleet as 10,000 yard range due to thick mist. 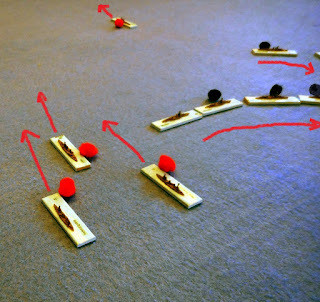 We engaged the British ships, sinking one and forcing the others to flee. The lead ships of the German battlecruiser squadron - SMS Lutzow, SMS Hindenburg (did I not mention some ships were present that never made it to Jutland? ), and SMS Seydlitz, plus some of the destroyer half-flotillas. Shortly afterwards, the British battlecruisers were sighted, steaming towards my command. After some minutes maneuvering to bring my guns into their most efficient aspect, I began firing at the British. The lead ships of the British battlescruisers, lead by HMS Tiger. After several ranging volleys, I concentrated my fire on two of the British battlecruisers, resulting in stupendous explosions as their magazines blew up. So much for the vaunted British battlecruisers! Opening moves. The German battlecruisers and two battleship squadrons are in the center on the dark colored bases. The German light ships (light cruisers and destroyers) have a black bar on the stern of their bases. The rest of the ships are British. The British did score some hits on my ships, most notable reducing the speed of the SMS Goeben resulting in her leaving the battleline to begin her return to Jade. On the left, Jim's German destroyers launch ineffective torpedo attacks at the British battlecruisers, forcing three to turn away. The pinkish tags indicate ships that have suffered movement penalties. The same turn taken from the other German flank as Jay's British destroyers launch attacks against Ed's German battleships, forcing several of them to turn away. 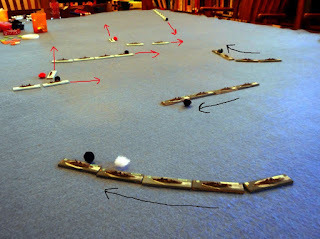 Travis' German battleship squadron is in the left center and Jim's German battlecruisers are beyond him. As more and more British battle squadrons appeared through the lifting mist, our squadrons maneuvered to get the most effective angles on the British ships. The British fast Queen Elizabeth battleships were the most dangerous, but lucky hits forced one away with severe boiler damage and a second stopped dead in the water due to steering problems, as well as reducing the gunnery on several others. The action in the center gets confused as Travis' German battleships and Jim's German battlecruisers turn away from the main British battleship squadrons. Can you say, "Crossing the T?" as Jim's German battlecruisers (dark bases on right) cross Sean's British battlecruiser line. The resulting gunfire from the Germans sank the lead British battlecruiser. Two of the British main battleship squadrons of Queen Elizabeth and King George V class battleships are in the left (KGV) and center (QE) background. My four remaining battlecruisers were successful in crossing the T of the British battlecruisers, sending the lead one (HMS Tiger, I believe) to the bottom in another stupendous explosion." All told the British lost six battlecruisers (three from Beatty's squadron and three from the main fleet), several older battleships, and several armored cruisers, plus suffered severe damage on at least four other more modern battleships. The High Seas Fleet only lost one capitol ship, the SMS Von der Tann, which was overwhelmed by many salvos from the British battleships. Two or three other capitol ships (SMS Hindenburg, SMS Helgoland, and one other) suffered severe damage and will be under repair for a number on months. Jay, Lord Sterling, proclaimed a victory for the German High Seas fleet. But more importantly, all of us had a great time and a great game!! It has been a long time since I really did anything "naval" enough to post here. But my good friend and long-time war gaming buddy Jay and I have finally made the plunge into WW2 coastal warfare. He and I have been dodging around this genre for a long time. 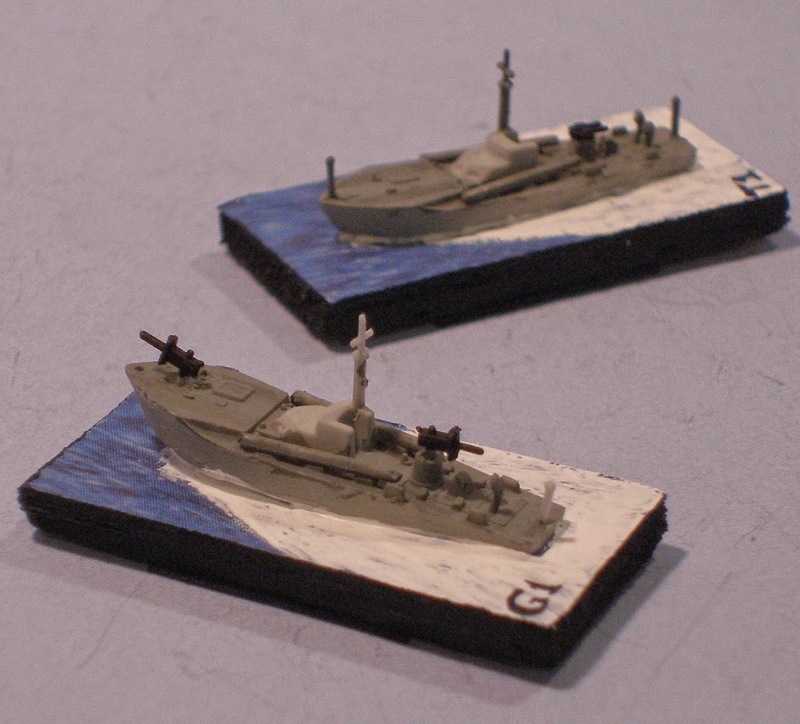 Jay got it started last year by getting some 1:700 scale plastic motor torpedo boats. He added a box of various small ships and I followed with another box on MTBs. Our first game is tomorrow. 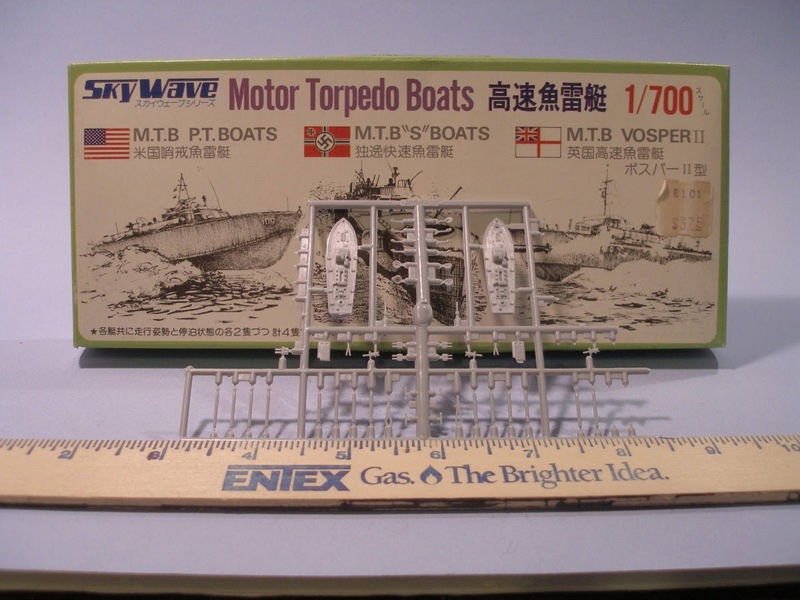 This is the Skywave 1:700 scale Motor Torpedo Boats kit. It contains four each of the three types of boats listed on the cover - American PT boats, German "S" boats (or "E" boats), and British Vospers MTBs. There is a plethora of teeny tiny parts that I had to use tweezers to install. Even then some of them got away from me so a couple of my boats are missing vents or flag staves. Shown propped against the box are two of the American PT boats with their various parts and a inch scale ruler. Two of my four German boats in their white-grey paint job. The Germans found that this was the best paint scheme to make the boats essentially disappear at night in the North Sea. 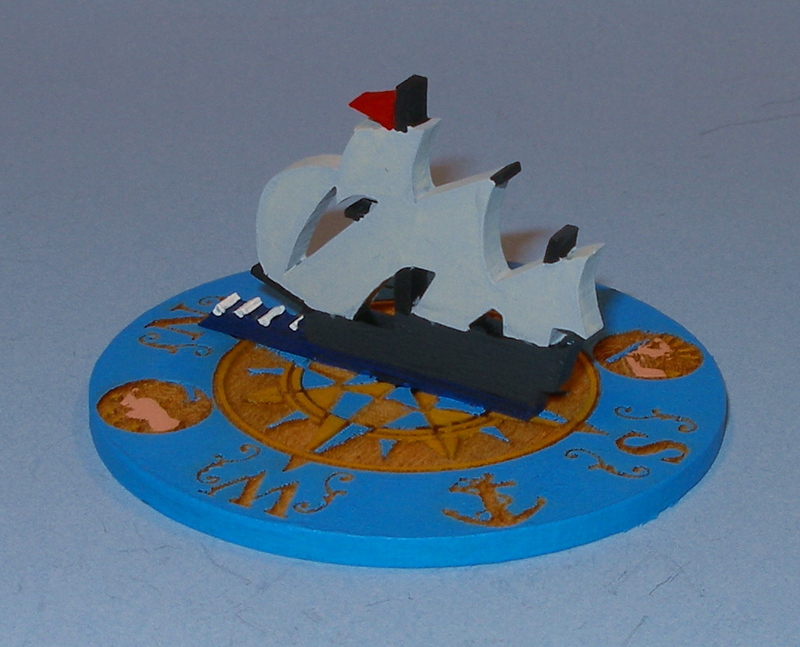 The boats are mounted on 60mm x 20mm bases, to give you an idea of their small size. 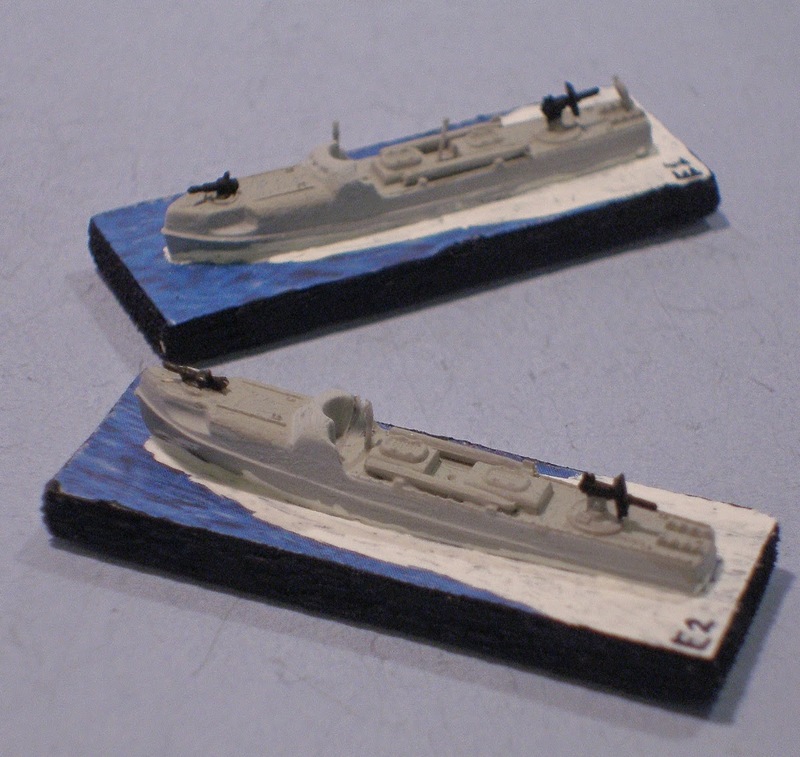 And two of my British Vospers, the closer up-gunned into a facsimile of a motor gunboat and the further in its basic motor torpedo boat guise. I have two of each type. 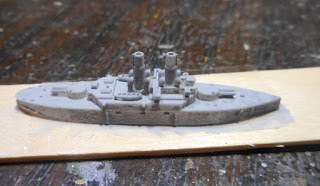 The British used a slightly darker grey so I used the medium grey of the German's decks on the British hulls and a darker grey on the British decks. These are mounted on 40mm x 20mm bases. I'm not sure ﻿what rules we'll be using as Jay has the penchant for devising his own using bits and pieces from other sets. But whatever the rules are, I'm sure we'll have fun if only in trying to keep from running into each other! Photo courtesy of Litko website. I carefully painted the outer circular base with "Ocean Reef Blue" from Delta Ceramcoat line and highlighted the two engraved heads and the points of the inner ring with yellow ocher and flesh. The inner circle base was painted with the blue and ocher yellow. The ship was first undercoated with gray matte medium and then painted with a charcoal hull, gray-white sails, and black masts. The water was painted dark blue with white caps on the waves. 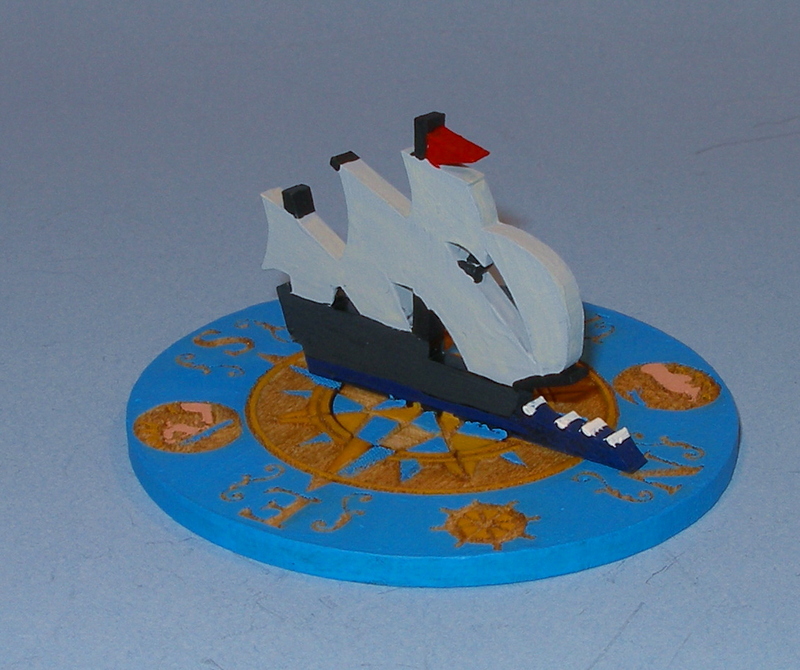 Overall, I think it looks very good and will (hopefully) soon see use in a sailing naval game.